Hartford, Connecticut: Connecticut Historical Society Museum, 2005. Hardcover. VG/VG. Brown cloth over boards; Color pictorial dj. ; 551 pp. ; 450+ color and bw figures. 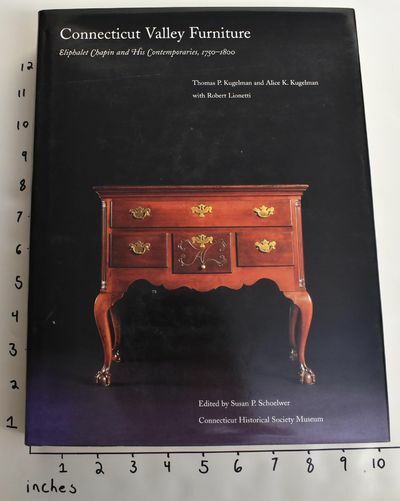 Accompanied the 2005/6 exhibition of the same name; A comprehensive study of Connecticut valley furniture, including Queen Anne, Wethersfield, Chapin, Colchester, Springfield-Northampton, and other styles; Includes maps, a glossary, and biographies of cabinetmakers; A great resource; Heavy at 8 pounds. Connecticut Valley Furniture offers the first-ever systematic framework for classifying eighteenth-century Connecticut case furniture - high chests, dressing tables, desks, bureaus, chests-on-chests. Nearly two hundred illustrated entries present the findings of the Hartford Case Furniture Study, an extensive field study of over five hundred regional examples conducted over fourteen years by independent furniture scholars Thomas P. Kugelman and Alice K. Kugelman and furniture consultant and restorer Robert Lionetti. The book defines four major style centers emanating from the towns of Wethersfield, East Windsor, and Colchester, Connecticut, as well the Springfield-Northampton region of Massachusetts. Over half of the illustrations feature unpublished or little-known furniture pieces discovered in private or small institutional collections, in addition to the extraordinary holdings of the Connecticut Historical Society Museum and other major collections. Complementing the text are period maps, an illustrated glossary, biographies of selected cabinetmakers, and six interpretive essays.